ES has been very resilient on strong resistance level. While we don't see it breaking right now, it is an eventuality to consider still. In such a case, prices would just move to the segment or range above with 843 being a new support and 875 being a new resistance. Again, our favourite scenario is rather a pullback to pivot level (~812) once buying pressure abates a bit. Looking at ER (aka TF) now, it seems that there is still some fuel here to aim a little higher. ER is now only inches away from stall level around 460 and even strong resistance level on 468. Energy levels are low, but probably sufficient to creep higher on momentum residual. ER: same situation, but we'll watch 468 carefully as a trigger for a potential reversal point. NOTE: in both cases, MTFS is clear on the necessity to have a retracement coming soon, so going long now is risky at these levels. "The early signs of recovery we detected last week are more visible, but at the same time, also show indications of the "early crossover" pattern, in other words a choppy recovery at best, and a pattern failure otherwise. We still gear towards a reversal over the longer run, so longer term players may want to look at favourable entry points if they are not long already. We still assume recent lows represent the absolute bottom." Current recovery is still underway, and one wonders if the current momentum can take prices all the way to Fib PR1. Would be surprising though, but that scenario is enticing as we have MM/Fib level almost matching perfectly (1000 for ES, 500 for ER)... Looks too obvious, and energy isn't quite there, so the pullback mentioned above on lower time frames is probably required to gather further strength. 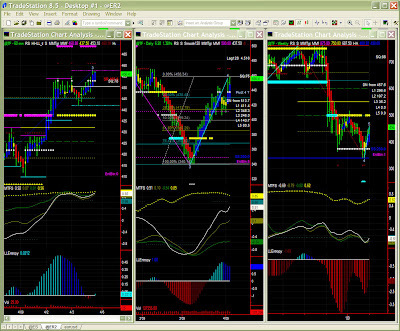 NOTE: this report is based is based on these time frames to be consistent with a daily market update. 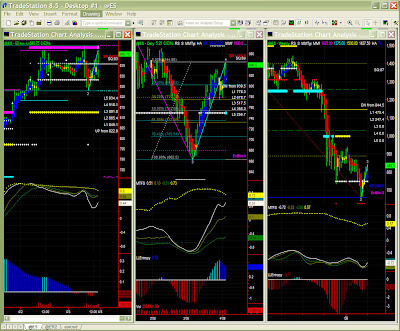 This TradeStation toolset can be applied to any symbol and any time frame.